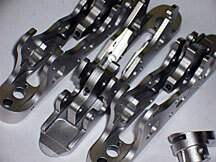 Electroless nickel plating is an auto-catalytic reaction used to deposit a coating of nickel on a substrate. Unlike electroplating, it is not necessary to pass an electric current through the solution to form a deposit on Carbon and High Alloy Steels, Aluminum, Copper, Copper Alloys and Zinc Die Cast. 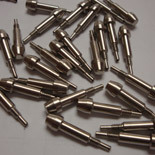 Electroless nickel plating has several advantages versus electroplating. Free from flux-density and power supply issues, it provides an even deposit regardless of parts geometry. Electroless nickel deposits are therefore very uniform in thickness all over the part's shape and size. This process offers distinct advantages when plating irregularly shaped objects, holes, recesses, internal surfaces, valves or threaded parts. Wherever the solution touches the part, deposition will occur, with no edge build-up, misses or burns normally associated with electroplating. Because the coating is deposited chemically rather than with electricity no expensive anodes, jigs or special racks are required. Often times the actual thickness required can be reduced verses electroplating thereby saving metal costs. Electroless nickel is the preferred choice among functional coatings for irregularly shaped, highly detailed part geometries because of its completely uniform deposit thickness and close dimensional tolerance capabilities. Medium Phosphorus Electroless Nickel is an alloy of 6-9% Phosphorus in nickel and is specified wherever a uniform, hard and moderately corrosion resistant coating is required. This is a workhorse electroless nickel. It has proven itself over the years. Steel parts plated with Medium Phosphorous electroless nickel will in many cases perform like stainless steel. Electroless nickel will not build up on edges or ends, and it plates inside and out giving uniform total coverage. Its high hardness and bright deposit make it an ideal barrier coating for components needing wear resistance and a bright cosmetic appearance at a competitive price. The as-plated hardness of Mid-phosphorus electroless nickel is approximately 54-56 Rc and can be heat treated to 65-68 Rc for a more wear resistant finish. Before performing electroless nickel plating, the material to be plated must be cleaned in a series of alkaline and acid cleaners. Failure to remove unwanted oils and scale from the part's surface will result in poor plating. Each pre-treatment chemical must be followed by water rinsing (normally two to three times) to remove the chemical that adheres to the surface. De-greasing removes oils from the surface; acid cleaning removes scaling. Activation is done with a weak acid etch, or nickel strike, After the plating process, plated materials must be finished with an anti-oxidation or anti-tarnish chemical trisodium phosphate and pure water rinsing to prevent unwanted stains. The rinsing materials must then be completely dried off or sometimes baked off to obtain the full hardness of the plating film.